Pork tenderloin stuffed with prosciutto, mozzarella, baby spinach and sun dried tomatoes; a wonderful dish for the Holidays. Serve this with potato parsnip mash, skinny garlic mashed potatoes, or creamy cauliflower puree and some roasted vegetables on the side. Are you ready for the holidays? I’m so behind but I did get around to seeing Santa this weekend. A very excited Madison didn’t cry and even gave Santa a list of what she wanted (which included a pony). I just love this innocent age, I wish I could freeze time. These next few weeks I’m going to focus on Holiday dishes, sides, appetizers and desserts. I’m still running my mile a day until the New Year (lost track of how many days it’s been), it’s a nice balance to some of the baking that’s happening around here. Pork tenderloin is perfect for the holidays, and it’s just as lean as chicken breast. I love how the colors of the spinach and sundried tomatoes look so festive when you cut it open. You can easily double this recipe to serve eight. If you’ve never butterflied a tenderloin, it’s not very hard. I found this video on how to cut a pork tenderloin which you may find helpful, although I cut mine a little different as described below. Either way is fine. 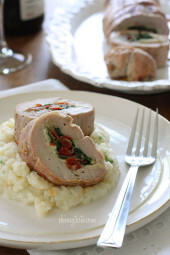 Pork tenderloin stuffed with prosciutto, mozzarella, baby spinach and sun dried tomatoes; a wonderful dish for the Holidays. Serve this with potato parsnip mash, skinny garlic mashed potatoes, or creamy cauliflower puree and some roasted vegetables on the side. Combine crushed garlic, lemon juice, mustard, olive oil, and pepper; mix well. Cut a lengthwise slit down the center of the tenderloin to within 1/2- inch of bottom (careful not to cut all the way through). Open tenderloin so it lies flat. On each half, make another, lengthwise slit down the center to within 1/2-inch of bottom; cover with plastic wrap. Flatten to 1/4-in. thickness with a mallet. Remove plastic wrap; spread 1/2 of the garlic/Dijon mixture on the inside of the pork. 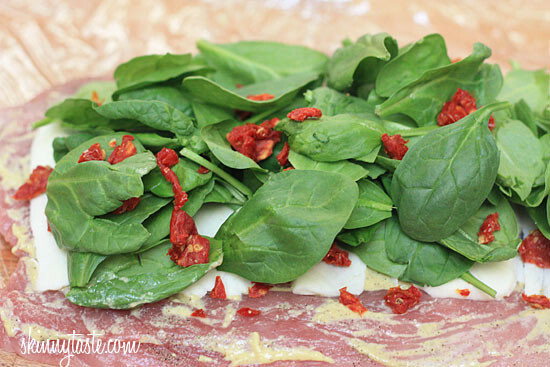 Layer the cheese, spinach, sun dried tomatoes and proscuitto on top, press down gently. Roll up pork jelly-roll style, starting with a long side. Tie the roast at 1-1/2-inch to 2-inch intervals with kitchen string. Season lightly with salt, and remaining garlic/Dijon mixture. Place on a rack in a shallow baking pan. Bake, uncovered, at 425° for 25-30 minutes or until a meat thermometer reads 160°. Place under the broiler to brown the top for 5 minutes, then transfer to a serving platter or cutting board. Let stand 10 minutes before removing string and slicing. Slice in 8 pieces. SO YOU WORKED SO HARD ON WRITING THIS COMMENT ONLY TO GIVE NEGATIVE REVIEW AND BRING SOMEONE DOWN? WOW this pork tenderloin is a definite four star. Really good recipe. This is my go-to recipe for pork loin Goes well with a pesto sauce; cook some onion, add brandy, pesto and chicken stock. This pork loin is OUTSTANDING! Flavors are awesome. Family loved it. Definitely on the make again list! This dish is amazing. It’s beautiful, and Absolutely delicious!! Served it to company, with RAVE reviews! Thank you Gina!! 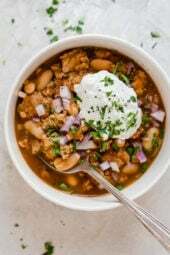 This recipe is insanely good!!!! I’m making it again this weekend. I made this one tonight with a small change. Instead of putting the prosciutto inside the pork, I wrapped the tenderloin role in the prosciutto and used the extra mustard sauce as ” glue”. 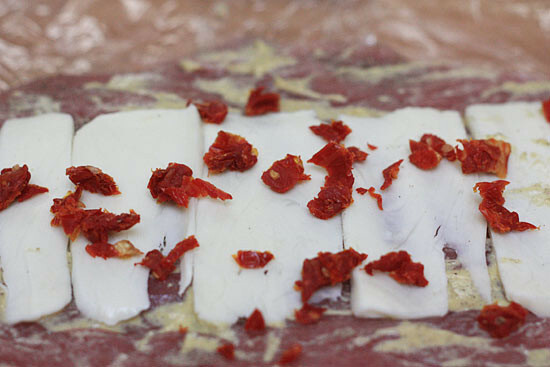 3 reasons… First, I hate chewy prosciutto in the middle of recipes. This way the prosciutto was crispy. Second, the fat rendered from the prosciutto kept the pork moist. Third, it is much prettier than “gray” cooked pork tenderloin. All in all a great recipe and wonderful flavor profile. Do you think I could put this all together and bake the next day? This recipe is AMAZING. Just made for a pre-Christmas dinner with family and everyone raved about it! Even my husband, who doesn’t really like pork. Thank you so much for this fabulous recipe! I used a 3.3 lb pork loin, 375 degrees for 1 hour and 20 mins. Perfection! I’m in the process of making this now, but the oil, lemon juice, dijon mixture that’s supposed to be “spreadable”, according to the directions, is like liquid. I’ve remade the mixture twice and it’s the same. 2 tablespoons of lemon juice and 2 teaspoons of dijon doesn’t make something that turns out spreadable. ?? Help! It’s very watery so I’m afraid maybe there’s a mistake on the recipe (or it’s supposed to be watery and not actually “spread”). Thanks! I knew there was a reason I pulled that tenderloin out of the freezer yesterday. Thanks for dinner tonight Gina. I made this tonight and it was fantastic! Instead of mashed potatoes, I served it with your Lime Fiesta Rice. Is it possible to prepare this and freeze it for cooking at a later date? I'd like to make 2 at once, one for tonight, one for later. Hey guys, quick question. What's the best way to prepare this the night before to serve the next day? Do I just prepare normally, stick it in the fridge and warm the next day in the oven? I'm wanting to prepare this tonight to serve tomorrow for Thanksgiving. Any help is appreciated! Happy Thanksgiving! Really delicious! Everyone had seconds. Matched this with the sauteed brussel sprouts and prosciutto and the Mushroom Quinoa Stuffing. Thanks for the wonderful ideas. WOW. This was amazing! So tender, and flavorful. My husband raved about this dish and has requested I make it again this week 😉 I didn't have kitchen string but luckily it held its roll without it. Also' the idea of the Dijon lemon sauce sounded amazing so I doubled it and it was not too much at all! Added lots of extra garlic too per my hubby's love of all things garlic. Did not have sundried tomatoes on hand but next time I'm going to make sure I have them because I can see how they'd compliment this dish well. Thank you for helping me try something new! I've never butterflied a pork loin let alone used a meat mallet (well technically I used the back of my metal citrus press haha) so this made me feel very confident in trying something out of my comfort zone! So thankful for your website Gina!! 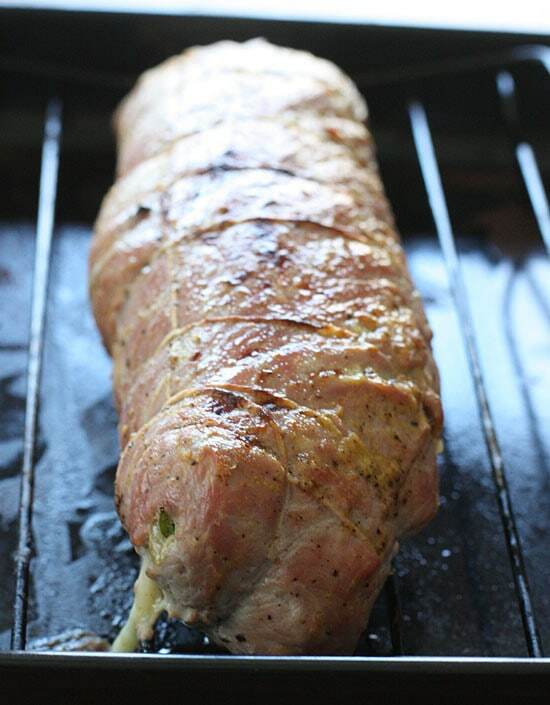 This recipe was the best way to cook a pork tender loin, very moist and the best I have ever had! Thanks Gina!!! This was soooo good! My 18-month-old devoured it! Made this for dinner tonight. We used lambs-quarter, Canadian bacon, smoked gouda and roasted red pepper. Amazing! Thanks for the idea. Made this for Christmas dinner today. It is sooo good. Thank you!! could you do this in crock pot? Can you cook this in a pressure cooker instead of the oven? Sear it in a pan first then put in pressure cooker with a little bit of chicken broth and cook it for 20 min or so? Would the stuffing hold up? made it this evening. YUM! I made one minor addition: I added about 1/2oz of smoked Gouda. Popping full of flavor and very very tasty! This was so delicious and so fancy looking but so easy to make!! Thank you for the awesome recipe! It was so good that I'm making it again tonight! I made this and it was excellent. It inspired me to make it again with broccoli rabe, provolone and roasted peppers (my favorite way to eat a pork sandwich). I made this for lunch today and it was DELICIOUS!! this is amazing. i used feta instead of mozzarella and left out proscuitto. definitely going to do this again. I made this for the first time on Thursday… it is Saturday, and I am making it again with the other half of the pork loin! Everyone loved it! Thanks! I made this for my parents 50th wedding anniversary for 40 people and it was a huge success!! It was so easy and delicious…Everyohe wanted the recipe! Thanks for all your delicious recipes…I've become a skinnytaste addict! I plan my weekly menu with your website! Thanks again and Happy New Year! Made this tonight and it was AWESOME. Thanks, Gina and Happy New Year! I made this the other night. It was amazing. My husband still questions me on if the recipes I've been cooking for the past year are actually low calorie. He doesn't believe me half the time, but I'm still losing all that weight I gained in graduate school, so I know its true. I didn't have any string, so I just wrapped it tightly and placed it seam side down. I thought it might unravel a bit, but the taste would work out. It actually didn't unravel at all, turned out perfectly and tasted amazing. Hi Gina, Did you use Dijon with the mustard seed in it or the smooth kind? Do you think it makes a difference? I'm making this for Christmas – it looks so pretty! Thank you! We made this for Sunday dinner tonight and it was amazing. Just enough seasoning and super flavorful. This recipe was a hit at my husband's and my first dinner party in our new apartment. I made it last night after work for some friends as a "thank you for helping us move" dinner. The pork loin tastes like it took a lot longer to make than it actually did. Strangely enough, I couldn't find kitchen string anywhere at our large grocery store (or even unwaxed dental floss), so I wound up not tying it. It still held together and turned out amazingly moist and flavorful. We will be making it again! Made this tonight with boneless porkchops (used toothpicks to keep the together while baking). So yummy! This looks yummy! I'm trying it for Christmas day dinner, so wish me luck. The loin thats in my freezer is almost 4lbs. Gina do you think it will work if I double the other ingredients with this big a roast? Thanks for this recipe idea, and "Happy Holidays" to all. Sure, but cooking time will change. Gina, do you think this stuffing would work with chicken breasts? I cooked the pork tenderloin and it was so good! Just a thought with the chicken. It would be great, I would cook it for less time. I made this last night and it was amazing! 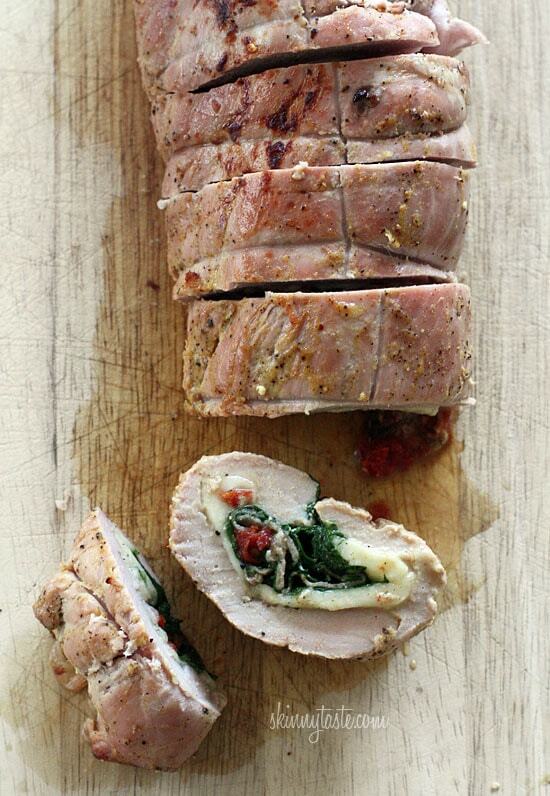 Such a simple way to amp up an already easy to cook pork tenderloin! It's great for a holiday dinner, but I would have easily made this on a weeknight too! Delicious. Thank you! Hey Gina, question: could I sear the pork in a pan before putting it in the oven? And if so, how much would I reduce the oven time by? Sure, use your thermometer to see the internal temp. Thank you for the amazing recipe!!! Made this tonight and will for sure make it again! I didn't have a rack, so I just used a glass baking pan….came out great! Making this tomorrow for Sunday dinner (mother-in-law will be attending). I don't have a rack that sits in a pan … should I just use my broiler pan instead? Or would a 11×9 casserole dish work? This is soooooo good! 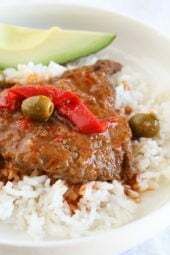 I had it for dinner last night and the family loved it which is great because I have picky eaters between my husband and son. I keep looking on your sight to see if you have a recipe for a skinny navy bean soup. I love it but am not sure home to skinny it up. It was comfort food when I was a kid. 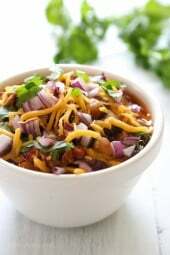 Any chance you could create a recipe or give me some tips to skinny it up but keep the great hearty taste?? Hi Gina.. Have you ever frozen proscuitto before? I never freeze meat so I am wary. Hopefully you can help. thanks! No I never did. I usually eat the rest! I have a great simple sandwich on a french baguette that's really good. Made this last night, my wife and I both loved it. Thanks for all the great recipes! Yum! This looks so delicious! I've never butterflied pork loin before, but it's something I've always wanted to do. I'm definitely going to have to make this soon. PS. Your daughter is beautiful! This looks great! Quick question: Is there a more specific measurement than "two slices?" Would you happen to know the ounces? I think it was 1 oz. It's very thin. I made the pork and the parsnip potato mash for dinner last night. My husband couldn't believe his eyes! It was all delicious! I'm making this again when my children come home from college. They'll love it! Thanks for all you do for us! I'm so glad you both enjoyed it! This looks amazing! Ignorant cooking question… does the tenderloin need to be cooked on a rack? If so does your pan have a rack built in or could I buy one to put in a pan? Thanks so much for all of your wonderful recipes! You can buy a rack, but it's fine if you don't have one. Another fantastic dinner tonight! Gina, I am so glad I found your site and keep directing everyone to it from my Facebook page. I am not one who can enter my kitchen and put together a delicious and low fat/low calorie meal. I can't wait to cook some of these for my 4 grown children when they come home for Christmas. Ran this by the boyfriend and definitely making for Christmas dinner! Yummy!!!!! Thanks once again, Gina! Your daughter is a DOLL! and this recipe sounds delicious. SweetMercifulBabyJesus. I can't stop staring at. THis looks delicious and festive! I definitely want to give this a whirl. Your daughter is so adorable. Thanks for the great photos. Can another type of cheese be used instead of mozzarella? Someone in my family cannot eat it due to a dietary restriction. If so, what would be a good substitution ? 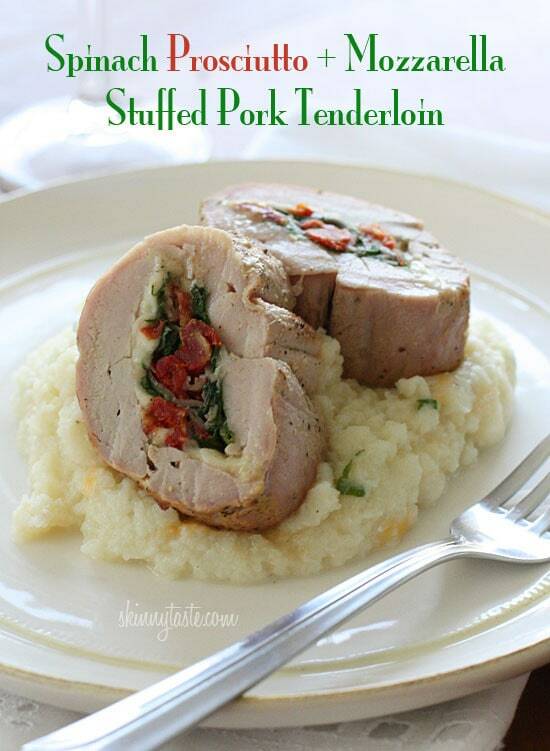 I love pork tenderloin and I am totally loving your filling! What a great recipe!! This looks great! Do you think I could leave out the prosciutto and sub-in chicken breast instead? I'm not a big fan! I don't see why you couldn't. Delicious!!! And Madison is so adorable! The recipe looks divine and your daughter looks like an angel. Please give her a hug from me and my family. Is the mozzarella Polly-O string cheese? If so, do you just tear or cut it into smaller pieces? Could you use fresh mozzarella? Thank you for all of your amazing recipes! No they sell a block of cheese that I sliced but string cheese would work. What a wonderful holiday main dish. Glad you made time to see Santa! 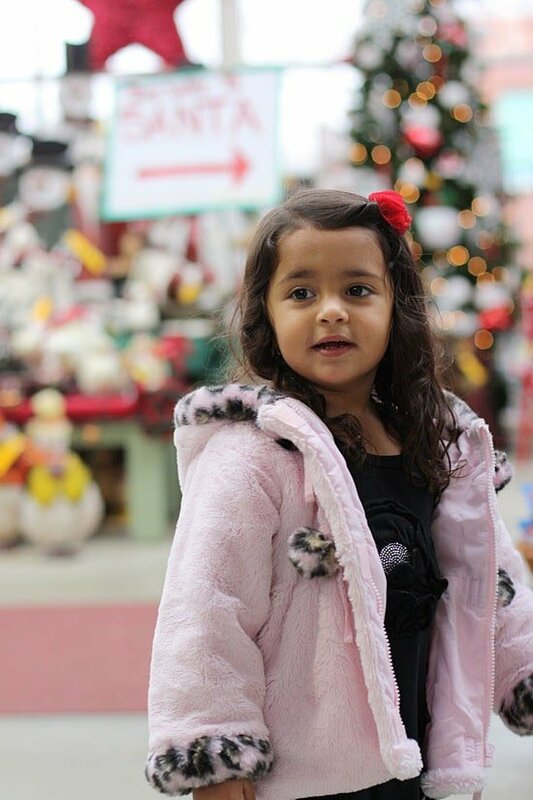 You daughter is adorable in her little pink coat. And this recipe looks absolutely delicious! I can't wait until Christmas to try it. I'm buying a pork loin tomorrow! Wow, your daughter is gorgeous! Everything I have ever tried from your site is delicious. I'm going to try this this weekend. Thanks! This looks absolutely delicious! Love it! It looks yummy and amazing. I loved. It looks really good. Thanks for the photos on how to open it up and stuff the tenderloin! Oh my goodness! I've been debating about what to make for our main dish for christmas eve dinner…..I'm going to test this out ASAP and it might be the one! The colors of the stuffing really are very pretty and festive! And man is this a protein-packed meal! Sounds delicious! I saw this on the Pinterest home page before and didn't bother clicking because I figured it wasn't WW! So happy when I went to your page and saw it was! Woohoo! Did you use sun dried tomatoes packed in oil or no? I can't believe I actually have all the ingredients for this recipe on hand!! Very ignorant, but can you explain a bit more about how to tie the string around the meat? Love the recipe, will try it. If you watch the video that I linked to above, it shows you how. This looks amazing! I am going to make it this weekend! In the first picture, what is the pork sitting on top of? Do you think this would work well with arugula and goat cheese instead of spinach and mozz? I'm not sure if the flavor profiles of the pork would mesh well. Not sure about the goat cheese but the arugula would be great. I have a book called The Flavor Bible (an awesome book!) which takes categories of ingredients and pairs them. It shows goat cheese pairing with arugula and pancetta so one could assume that if arugula works with pork then the two "should" work together. Wow! Looks delish! Where do you buy kitchen string? I've never used it before. I've had it a while, got it in the supermarket. Thinks Giney Gine. I am off to the supermarket!!! this looks awesome. def making it soon!!! I have a loin in the freezer, Sunday dinner, and a bag of potatoes I need to use. Thank you!!! All is can say is – OMG. Will be trying this and I'm sure that my hubby will be very excited. Thanks, Gina!